We advise reading the Evidence page before you get started. What is overall parental engagement like in your school or at the moment? What are you doing to encourage parental engagement in maths at the moment? What is working well at the moment and what could be improved? What do they feel is working well and what could be improved? What might prevent families from engaging with school and maths learning? What do families need to improve engagement that you are not already providing? What would you like to achieve from engaging families with maths? When do you want to achieve this? Set a realistic timescale. Visit our Information for Schools page and look at our resources and approaches. Identify which ones could work for your school. 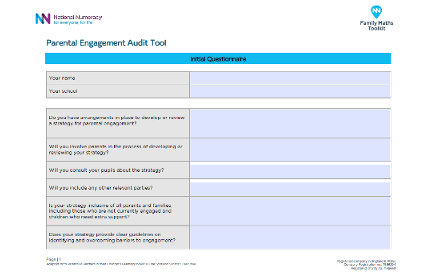 What will help remove the barriers to engagement that you have identified? How will you tailor the resources and approaches to work best for the families at your school? Create a week-by-week action plan for implementing your ideas for engaging families, taking into account the timescale you set yourself. Identify your team and their individual responsibilities. What are the risks and how can you overcome any setbacks? Will you use a Parents' Champion? You’ll need your staff on board to make your engagement plan work. Visit our Evidence page and share our research and stories with your team, showing them importance and benefits of parental engagement. Identify the resources you found most useful. What was it that helped you? How can you use these ideas in your plan? Discuss the tasks you assigned to your team. What amendments do you need to make based on their feedback? Speak to staff, parents, school governors and pupils about your parental engagement action plan. Make them aware of your parental engagement team who may be able to answer any questions or give advice. 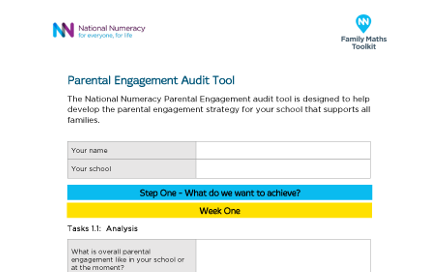 Talk to them about the National Numeracy Family Maths Toolkit where they can find out more about the benefits of engaging families and find out what other schools have done. Keep in contact with your team to monitor progress and successes. How is your action plan going? Can you make any improvements at this stage? Do any staff or families need extra support and how will you address these? Speak to families, staff and pupils. Ask them what difference they have noticed since implementing your action plan and what changes they would like to see to improve further engagement. You can collect this information through questionnaires, informal interviews, focus groups or surveys – it’s up to you to make it work for your school. Meet with your team to evaluate your parental engagement action plan. Discuss what has worked well and what improvements you could make. Once you have collated your findings, present your outcomes to stakeholders and celebrate your achievements so far. What has been most successful in your action plan and what improvements can you make going forward? Agree the next steps to keep up momentum.